Thank you to Pangratios Papacosta, Professor of Physics at Columbia College Chicago, who suggested two women in Astronomy he says contributed much to science, despite gender discrimination. Papacosta brings our attention to Henrietta Leavitt, whose 1908 discovery of using Cepheid stars to measure long distances to stars and galaxies was the key that enabled Hubble and others to make monumental discoveries about our universe. 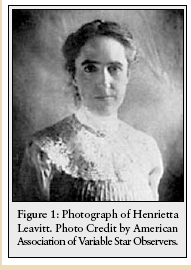 He spent 8 years doing work on H. Leavitt and shared some of this work in an article “Nobel Prize for a “Computer” named Henrietta Leavitt (1868–1921)” in the January 2005 issue of STATUS, a report on women in Astronomy. With colleagues in the film department of his college Papacosta produced a 17-minute documentary on Leavitt that was shown at a number of International Astronomy conferences including an International Conference on the History of Physics at Cambridge University last September. You can view the video here. Papacosta’s other GGSTEM contribution is about Dorrit Hoffleit. This entry was posted in Astronomy, Physics and tagged astronomy, physics. Bookmark the permalink.